Dante Ferretti, Francesa LoSchivo and Maria Garcia at The Museum of Modern Art in New York City. Behind us are lion sculptures Signore Ferretti designed for the 65th annual Venice Film Festival. My interview with the iconic Italian production designer Signore Dante Ferretti, and his wife, set decorator Signora LoSchiavo, will appear in print in the Winter issue of Cineaste Magazine, which will be on newsstands this week. Signore Ferretti recently won his third Oscar for Martin Scorsese’s Hugo (2012), on which Signora Lo Schiavo “dressed” the sets. Production designers are members of a movie’s principal crew, which includes the director, costume designer, cinematographer and film editor. They are responsible for all aspects of a motion picture’s design, and supervise the construction of sets and alterations to the film’s locations. The task of the set decorator is to choose and place furniture, draperies, and other objects on the set or location under the supervision of the production designer. In Hugo, for instance, Signora Lo Schiavo’s work may be seen in the delightful arrangement of books in the train station’s library, or in the choice of flowers for the flower seller’s carts, as well as in their positioning inside that built set. Signore Ferretti speaks with the press at MoMA. Behind him are some of his paintings and sketches rendered in preparation for the building of various film sets. They can be seen in the exhibition, "Designing for the Screen." In my Cineaste interview, Signore Ferretti and Signora Lo Schiavo discuss their preference for built sets and real objects, as well as the challenges of their creative partnership. Signore Ferretti, the subject of a current MoMA exhibition, recalls his 40-year career in film and theater, which includes some wonderful memories of his collaborations with Federico Fellini. More information on the MoMA tribute to Signore Ferretti may be found here: http://www.moma.org/visit/calendar/films/1415. I have just added a link ("Feature Articles, Print/Online") to my interview with Ms. Polley, the writer-director of Stories We Tell. This is the filmmaker's debut documentary and her third feature film. Polley's first two movies as writer-director were Away From Her and Take This Waltz. Stories We Tell opens in theaters in May. 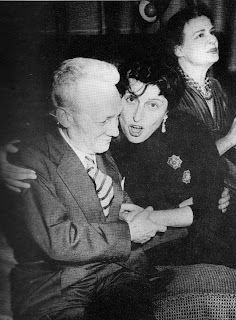 Anna Magnani and Joseph Burstyn (circa 1950). Mr. Burstyn was the distributor of Roberto Rossellini's "l'Amore," a pair of shorts in which Ms. Magnani starred. The Italian Embassy in the United States has joined with several other departments of the Italian government, and a few trade organizations, to declare 2013 The Year of Italian Culture in the United States. This year also marks the 40th anniversary of the death of Italian actress Anna Magnani, one of the most unique talents ever to grace the silver screen. It would seem a perfect time to celebrate her legacy, especially since Ms. Magnani holds a very special place in the history of American cinema. Only a fraction of Ms. Magnani’s Italian films are available to American audiences (including to those who do not need English subtitles) in any format, despite her iconic status in Italian Neo-Realist cinema. Below is the complete text of my Spring 2013 "On Film" column from Ambassador Magazine, which is a brief consideration of the remarkable woman Italians call “La Magnani” in recognition of her singularity. In her final film appearance, Anna Magnani is seen first as a shadow entering the frame. She is walking toward her home, the Palazzo Altieri in Rome, the camera tracking her from behind. It is evening, and she is alone in the chiaroscuro of a darkly lit street. Federico Fellini’s narration is lauding her as a symbol of Rome, a “she-wolf and vestal virgin, aristocrat and beggar.” When the camera reaches her, Magnani enters a door. She turns and faces the camera, which is in now in close-up. She inveigles: “What am I?” Fellini ignores the provocation, and bids the actress to allow him to question her. 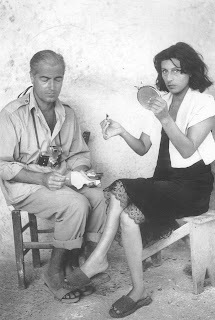 Magnani refuses. “I don’t trust you,” she says. Then, she closes the door, wresting control of the movie and her legacy. This festival is co-sponsored by the Museum of Modern Art and the Film Society of Lincoln Center. Each year, it screens shorts, feature documentaries and narrative films in New York City (at MoMA’s theaters and at the FSLC’s Walter Reade Theater) by first-time filmmakers from around the world. Some films open theatrically, but many do not because they fail to fit easily into a particular genre and so do not have wide box office appeal. The festival offers audiences the opportunity to see the first efforts of directors who may later go on to have distinguished careers—and, sometimes, actors making their screen debut. ND/NF, which is celebrating its 42nd anniversary in 2013, runs from March 20th-31st. Of special note this year are Sarah Polley’s “Stories We Tell” (Canada), Ali Aydin’s “Küf” (Turkey), Emil Christov’s “The Color of the Chameleon” (Bulgaria), and Leonardo di Constanza’s “l’Intervallo” (Italy). A photo of Sarah Polley and her father, Michael Polley, from the documentary "Stories We Tell." “Stories We Tell” is not Ms. Polley’s first film as a writer-director, although it is her first documentary. She wrote and directed two narrative films, “Away From Her” (2006), and the much-overlooked “Take This Waltz” (2011); Ms. Polley is also an accomplished actress, best-known in the U.S. for her performances in Atom Egoyan’s “The Sweet Hereafter” (1997) and, more recently, in Isabel Coixet’s “My Life Without Me” (2003). “Stories We Tell” is autobiographical, and features interviews conducted by Ms. Polley with her immediate family and family friends. 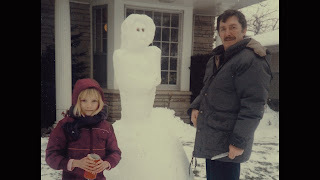 The documentary is about her mother who died when she was eleven years old, although it is also a nuanced investigation into the nature of memory, and often of abandonment. A still from Ali Aydin's “Küf," which is about Basri, a railroad worker whose son is one of Turkey's "disappeared." Mr. Aydin’s “Küf” (the English translation is “Mold”) is about Basri (Ercan Kesal), a railroad worker whose only child vanished eighteen years ago while he was a student at an Istanbul university. Every year since then, Basri has written letters to government agencies asking that his son’s disappearance be investigated. “Küf” was inspired by demonstrations the filmmaker witnessed in which mothers attempted to force authorities to investigate the disappearances of their children, many of whom were victims of political assassination. 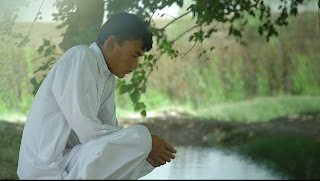 If Mr. Aydin’s purpose seems peripheral as the movie unfolds, it is because he has crafted a beautiful, haunting portrait of grief, but also of one man’s unstinting faith that someone in the government will eventually admit responsibility for his son’s death. The cast is excellent, especially Mr. Kesal and Muhammet Uzuner as the local police captain who befriends Basri. 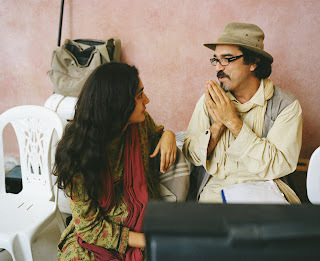 Viewers will remember these actors from Nuri Bilge Ceylan’s “Once Upon a Time in Anatolia” (2011). Reminiscent of the films of Robert Bresson, “Küf” is about the impossibility of earthly redemption. Mr. Christov’s “The Color of the Chameleon” is a satire, but many of the references it makes to Bulgaria’s history will be impossible for American audiences to grasp (unless the folks at www.balkanleaks.eu can explain.) Fortunately, the movie can also be appreciated as a spoof of spy films. Ruscen Vidinliev gives a wonderfully nuanced performance as Batko, a student recruited by the secret police to spy on dissidents. When he is later fired for some minor infraction, he invents his own spy game. While the script has some pitfalls, Mr. Christov’s direction is outstanding in nearly every respect. As the title implies, viewers must take pleasure in the circumstances of the moment where some brief glimmer of substantive purpose emerges from shades of concealment. A still from "l'Intervallo" in which Salvatore and Victoria look out over their neighborhood from the relative safety of a rooftop. Mr. di Constanza’s “l’Intervallo” (The Interval) begins with a tale about caged birds, narrated in voice-over, and then a long sequence in which we see a teenager and his father prepare their carts for a day of work. They are granita vendors in Naples. Salvatore, the son, is hired by the neighborhood Mafioso to mind a prisoner, Victoria, a teenage girl whose infraction Mr. di Constanza keeps secret until the end of the film. Over the course of the day in which the story unfolds, we get a glimpse of Salvatore and Victoria as carefree young people, but mostly what “l’Intervallo” provides is a terrifying portrait of their future in contemporary Southern Italy. Reminiscent of Italian Neo-Realist films, Mr. di Constanza’s critique is aimed at a government seemingly unable to grapple with the stranglehold of organized crime. While “Küf” illustrates the effect of years of corruption on one family, “l’Intervallo” presages it in the lives of two people who have barely begun to live. Photos: Courtesy of MoMA and Film Society of Lincoln Center. I have just added a link ("Feature Articles") to my interview with Pablo Larrain, the director of "No," nominated in the category of "Best Foreign Film." Larrain's candid remarks provide insight into his work as a politically committed filmmaker. "No" is the third film in Larrain's trilogy about Chile's turbulent past. The first two were "Post Mortem," about the coup which unseated President Salvador Allende and ushered in the dictatorship of Augusto Pinochet, and "Tony Manero," about a psychopath living during Pinochet's dictatorship who dreams of winning a national dance contest. 2. "The Loneliest Planet," Julia Loktev, U.S.
5. "Ai Wei Wei: Never Sorry," Alison Klayman, U.S.
6. "Words of Witness," Mai Iskander, U.S.
10. "Seeking a Friend for the End of the World," Lorene Scafaria, U.S. Check "Film Reviews" and "Feature Articles" on this blog for links to my print reviews of these films, and for my interviews with several of the directors. In the video below, my friend Melissa Hanson and I have some fun discussing our Top Ten picks for 2012. Below is my videotaped interview of Paolo and Vittorio Taviani which I conducted in October 2012 during the New York Film Festival premier of "Caesar Must Die" or "Cesare Deve Morire." The interview is in English and Italian.